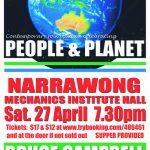 Bruce Campbell Collective is bringing its 3rd annual tour to South West Victoria. This tears concert is Earth Songs, a collection of “contemporary folk ballads.” Celebrating people and planet. Earth Songs features humorous,meaningful.upbeat and reflective tunes that will take the audience on a journey towards stronger communities and a sustainable planet. Earth Songs will be an entertaining and enjoyable show for all ages.